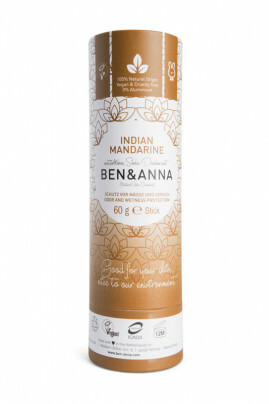 Composed of baking soda, the Ben & Anna Indian Mandarine Natural Deodorant Stick Papertube effectively protects against perspiration and moisture. Its fragrance embodies the sensuality and charm of India. Its fresh smell of citrus is a real olfactory pleasure. Made of 100% recycled and durable paper, its tube format offers easy application. Gentle, it respects the delicate skin of the armpits and leaves no greasy film. The Natural Deodorant Stick Papertube is without parabens and without aluminum salts! A respectful deodorant with recyclable packaging! Lightly remove the deodorant from the cardboard tube by pressing down. Apply directly to the clean and dry armpit. An ecological deodorant with a natural composition!